"Thoughts and prayers to family - worked with Ralph at FMC..."
"My deepest condolences to my classmate and friend Sharylyn..."
"What a true gentleman, I worked with Ralph at FMC for..."
"If there was ever a kinder man than Ralph,I don't know it...."
Funeral services for Ralph Herbert Gelvin, Sr., 91, Lawrence will be held at 2:00 p.m. Monday, November 5, 2018 at First Christian Church in Lawrence. Burial will follow at Oak Hill Cemetery. Ralph passed away Sunday, October 28, 2018 at Lawrence Memorial Hospital. He was born November 27, 1926 in Overland Park, KS the son of Guy and Pearl Gelvin. He served his country in the U.S. Navy during WWII aboard the USS Ranger in the Pacific Theatre from 1944 thru 1946, earning the Victory Medal and American Campaign Medal. At a Valentine's Day dance in February, 1947, his blind date for the night was Donna Sue Landrith. They met, fell in love, and celebrated their 70th Wedding Anniversary last March. When Donna's health failed, Ralph made daily trips to Pioneer Ridge. They played bingo together, ate supper together, and he would faithfully put her to bed every night. Ralph moved to Lawrence in 1949 where he was employed at Landrith's Finer Foods and was the owner for several years. He then worked at FMC for 25 years before retiring in 1989. Ralph was a proud member and Past Master of Masonic Lodge #6, AF & AM, where he also had served as Master of the Scottish Rite Bodies; York Rite Chapter & Council & Commandery, Past Commander of DeMolay Chapter IV; and Past Watchman of Shepherd of the White Shrine of Jerusalem. 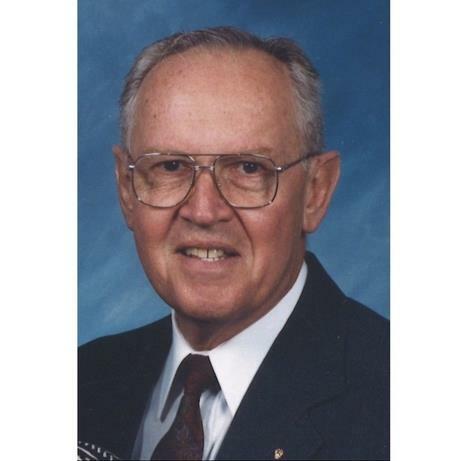 He was a member of the First Christian Church for over 50 years where he had served as Financial Secretary and Deacon. His passion in life was fishing and traveling to the Lake Country in Minnesota for almost 90 years. He traveled first with his parents, then with his wife, children, grandchildren and great-grandchildren. He instilled in all a love of fishing and the solitude of the lakes. Debate never ceased on whether a walleye or northern pike was the better catch of the day. Ralph was preceded in death by his parents and brother, Floyd; son-in-law, Phil Lacey; and granddaughter, Susan Gelvin. He is survived by his wife, Donna Sue; daughter, Sharylyn Lacey; son, Ralph, Jr. (Joann), five grandchildren, Matthew Gelvin, Jason (Skye) Lacey, Bryson Lacey, Alexia (Clark) Burgeson; five great-grandchildren, Scarlet and Eden Lacey, Ava, Eliana and Wyatt Burgeson; brother, Guy Gelvin; and sister, Ethel Brown. The family will greet friends from 2 – 4 p.m. on Sunday, November 4, 2018 at Warren-McElwain Mortuary. Memorial Contributions may be made in his name to First Christian Church or Lawrence Scottish Rite and may be sent in care of Warren-McElwain Mortuary.